As networks sag under the load of bandwidth-intensive applications and high-end processing requirements, government network designers increasingly are choosing Fast Ethernet and Gigabit Ethernet solutions to minimize their traffic bottlenecks. 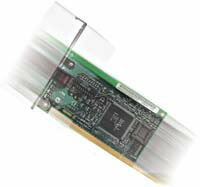 SMC Network's TigerCard 1000 SMC9462SX provides 1-Gbps speed in a 32/64-bit PCI bus interface. It's priced at $778. Fast Ethernet and Gigabit Ethernet make a great deal of sense for designing high-performance, mission-critical networks. At 100-Mbps, Fast Ethernet handles 10 times the load of 10-Mbps Ethernet; 1-Gbps Gigabit Ethernet multiplies Fast Ethernet's capacity an additional tenfold. Network design is simplified when migrating from one to another because all flavors of Ethernet employ the same Media Access Control layer interface, packet sizes and error-control techniques. Ethernet, Fast Ethernet and now Gigabit Ethernet can all use inexpensive Category 5 unshielded twisted-pair copper wiring'the same wiring used for telephone service in virtually every office building in the United States. Sales of both Fast Ethernet and Gigabit Ethernet network interface cards are soaring. A recent NIC market report from Cahners In-Stat Group, a high-tech market research company in Newton, Mass., said Fast Ethernet NICs accounted for about 75 percent of the 53.5 million NICs sold last year and are likely to grab an even higher percentage of the market this year. Sales of asynchronous transfer mode, token-ring, Fiber Distributed Data Interface and 10-Mbps Ethernet NICs are declining accordingly. Although Fast Ethernet NICs continue to hold the lion's share of the market, Gigabit adapters running on either fiber-optic cable or Category 5 copper wiring represent the fastest-growing market segment. In a story last year on Fast Ethernet NICs [GCN/Shopper, July 1999, Page 37], I argued that using 10/100-Mbps Fast Ethernet NICs, which enable simultaneous 100-Mbps connections to high-performance, end-user systems and 10-Mbps connections to slower computers, was the best way to future-proof government networks. My argument today is essentially the same, but the ante can be raised tenfold. Intel's Pro/100t Server Adapter provides 10/100-Mbps speed with a 32-bit PCI bus master interface. It's priced at $119. My best advice: Use Fast Ethernet NICs wherever possible; use Gigabit Ethernet NICs wherever they are needed. The accompanying chart features Fast Ethernet and Gigabit NICs built around 32-bit or 64-bit PCI bus technologies. Thirty-two-bit PCI buses running at 33 MHz are still found in most network servers, although 64-bit PCI buses running at 66 MHz are coming on strong. There are also products designed around the NuBus, Vera-Module Eurocard bus, EISA or 16-bit ISA buses used in legacy computers. Check with the manufacturers listed in the chart to see if they have cards using these technologies. Many manufacturers also provide PC Card NICs for notebook computers. NICs, also known as adapters, manage the essential connections between network servers or workstations and the network itself. All NICs come with on-board processors, various amounts of RAM and ports for connecting to the network and host server. Most also come with some type of proprietary or generic management software based on the Simple Network Management Protocol or Desktop Management Interface protocols. The management software allows users to access the NIC and other network components via an SNMP agent, Internet browser or Microsoft Windows console. Most NICs also come with drivers for common operating systems, such as Microsoft Windows NT and 2000, Novell NetWare and various flavors of Unix. Adaptec's Quartet64 has four ports with 10/100-Mbps speed and a 64-bit bus master interface. It's priced at $528. 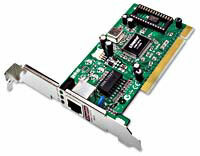 PCI bus. Along with its widespread use in Intel Corp. servers, the benefits of PCI bus technology include bus mastering, a technique by which the network passes requests directly to the NIC, thereby offloading work from the host CPU. Virtually all PCI NICs also work with Windows Plug and Play, meaning they can be automatically set up and configured by the Windows operating system. Speed. A NIC's speed is determined by two main factors: the number of bits it can handle and the processor it is built around. A 64-bit PCI NIC can process data twice as fast as a 32-bit NIC, but because 32-bit PCI buses are still most commonplace in servers, 32-bit NICs continue to dominate the marketplace. Most Gigabit NICs can manage both 32-bit and 64-bit PCI buses. As for the processor, check manufacturers' specifications, as many of them offer similar models with different processors. RAM. The more RAM a NIC has, the faster it can process information. High-end NICs often come with 1M or 2M of RAM and fast processors. Expect them to be priced according to their memory capacity. Fast EtheRx has a 32-bit PCI bus master interface with 10/100-Mbps speed. Port attachments. Most NICs attach to a server via a single port. Those with dual or quad attachments provide extra flexibility and some level of fault tolerance'if one server goes down, another can still run'but cost more. Full duplex. All Fast Ethernet and Gigabit Ethernet NICs are capable of full-duplex operation, meaning they transmit and receive simultaneously, effectively doubling their advertised speed. A 100-Mbps Fast Ethernet NIC can provide 200-Mbps speeds over a dedicated connection to a network switch. Auto-negotiation. Fast Ethernet NICs can automatically distinguish between 10-Mbps and 100-Mbps data signals and set themselves accordingly. Although many Gigabit Ethernet NICs operate only at 1,000-Mbps speeds, some'such as Asante Technologies Inc.'s GigaNIX and GigaNIC 1064SX and Netgear Inc.'s GA620T'offer full 10/100/1,000-Mbps auto-negotiation. Look for this trend to continue as more Gigabit NICs come to market. Wake on LAN. Cards with this feature enable network-attached systems to be booted up directly from the server instead of individually. Media and connectors. Fast Ethernet NICs can utilize both single-mode fiber (SMF) and multimode fiber (MMF) optic cable, but most use the cheaper and ubiquitous Category 5 copper wiring. They generally employ standard RJ-45 connectors. ST connectors are used with single-mode fiber and SC connectors are used with multimode fiber cabling.